Per U.S. Department of Health and Human Services 2008 Physical Activity Guidelines for Americans. Respondents were considered to be meeting aerobic activity guidelines if they reported moderate-intensity physical activity for ≥150 minutes leisure-time activity per week, vigorous-intensity physical activity for ≥75 minutes leisure-time activity per week, or an equivalent combination of moderate-intensity and vigorous-intensity leisure-time activity. 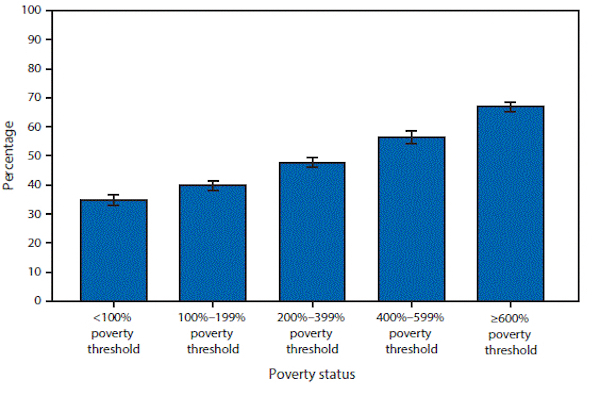 Poverty status is based on family income and family size using the 2013 U.S. Census Bureau poverty thresholds. Family income was imputed where missing. Estimates are based on household interviews of a sample of the civilian, noninstitutionalized U.S. population and are derived from the National Health Interview Survey sample adult component. Data Source: National Health Interview Survey data, 2014. This entry was posted in Medicine and Society Data Watch on May 11, 2016 by Christopher Barbey.